The adventure began back in 2000 when we decided to revert back to nature and start a radical change in our lifestyle. We moved from our city life environment in Chianti and began the restoration of the rural farmhouse, the vineyards and the garden with great enthusiasm, soon to become Ancora del Chianti, the first eco-friendly BB in Chianti. We believe in the promotion of sustainable tourism and an environmentally conscious lifestyle, endeavouring to reduce the negative impact on our environment. 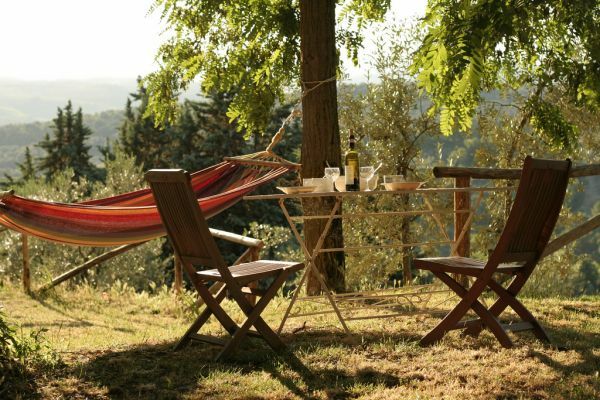 This is why, at Ancora del Chianti, we operate following an ethos of environmental sustainability for the benefit of our family, of our guests and for those who will follow in our footsteps, inviting our guests to contribute where they can. Renewable energy: In 2010 we installed a photovoltaic system which enables us to produce and consume energy using only the sun's rays without producing CO2 emissions. The old lamps have been replaced with with energy saving substitutes and each time we need to purchase new electrical goods we always opt for those with the minimal energy and reduced consumption. 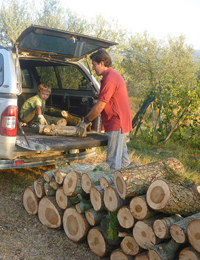 Biomass: Our family live at Ancora del Chianti all year round and with the arrival of winter heating is indispensible. Over the years we have replaced the old diesel oil heating with gas heating and in 2008 we finally converted to biomass heating using wood as fuel, which keeps us lovely and warm using only the trees in our woods and whatever other firewood we find nearby. The work has undoubtedly increased for all of us with Filippo gathering, chopping and transporting the wood to the wood-burning boiler and Laura filling and lighting the boiler every day in winter, making sure it is continually alight. The children are also happy to help where they can. The ash produced is also scattered directly to fertilize the fields or added to the compost pile. They contribute to beautiful vegetables and flowers! Water: Our water comes from our well. In addition to the water saving devices installed in the property we still ask our guests to use water sparingly, especially when taking a shower. The rainwater we use for the vegetable garden is collected in a large cistern in the barn, a century-old method used by generations of farmers. Soaps and Detergents: toiletries that guests find in the bathroom and cleaning detergents have vegetable origin and they are produced in Tuscany to preserve the environment and reduce the impact. In particular, toiletrie (hand soap, shampoo and shower gel) have a rich formula based on Tuscan olive oil with a pleasant and fresh natural fragrance assuring wellbeing to body and mind. Herbal purification: The purification of waste water is entrusted to nature herself, following modern techniques of herbal purification: the water is channelled into a tank and purified with the roots of particular water plants without the aid of mechanical or electrical processes. The purified water is then recycled to water the garden and the vegetable patch. Zero Waste Strategy: In June 2011 we joined the Wasteless in Chianti project from the European Community for the widespread practising of environmentally sustainable methods for production businesses via a reduction of waste. For example, in the bathrooms we provide re-fillable soap dispensers instead of disposable products, for breakfast, where possible, we have replaced single portioned items with self-service receptacles. We also encourage our guests to differentiate their waste by providing appropriate bins for glass, plastic, cans, paper and compost, which we then take to the appropriate collection point. Organic farming and preservation of the wildlife and biodiversity: In a constant personal effort to strive towards the world of organic and biodynamic farming, Laura and Filippo are happy to welcome and share new suggestions and experiences in this field. The vines, the olive trees, the garden and the vegetable patch are tended without the use of pesticides weedkiller or chemical fertilizers, favouring more traditional farming, pruning and harvesting methods in order to enjoy the authentic flavours of the past in a beautiful and healthy environment for ourselves, our guests and the animals that live here. 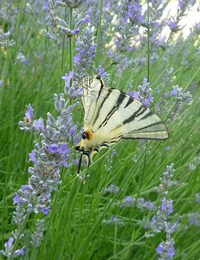 Providing a natural habitat also encourages the breeding of many beautiful species which are sensitive to environmental changes such as butterflies, dragonflies, beetles, humming birds, ladybirds, grasshoppers, cicadas, crickets and the romantic fireflies, which have all but disappeared from many other areas, lighting up the summer skies along with the stars. Interestingly, our Swedish guest and ornithology expert, Gunilla, has noted the presence of at least 44 different bird species around the property in the month of May, due to the abundance of food supplies and the favourable living habitat. Use of local and Fair Trade products: we favour the purchase of local products and direct relationships with the producers themselves. A prime example is our moka coffee; a jewel in the crown of our morning breakfast! We have been participating for several years in the Tatawloe Association's advance financing campaign for coffee which guarantees farmers a crucial financial advance on their crops, at a higher price than that paid by local brokers, to save them from incurring banking debts. Part of the amount collected is also put towards educational and training commitments in the local communities. 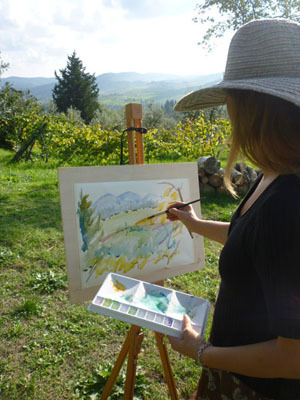 Promoting sustainability and local development: At Ancora del Chianti you will find useful information on: local organic farms where they produce wine, oil, cheeses etc; typical home-made produce; local artists' workshops and promotional events about organic farming and markets.